Invariably, the response will be a long list of questions like climate, soil, what they like to eat/cook, etc. that borders on interrogation – mouths agape, eyes glazed, head bobbing up and down, trying to take it all in. Yes, it can be tedious to think about these things! So to make it a little bit easier, here are several preliminary approaches you can take in deciding what to plant. You can certainly follow more than one strategy, keeping in mind your climate, soil, acreage, and personal tastes. Refrigerator Method. Open your fridge and think what has been in it over the last 12 months. What are things you will always find and what are “one-offs”? 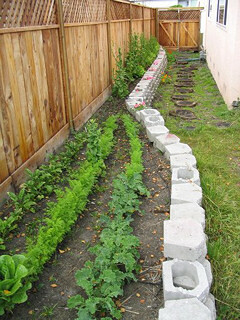 If you have a good climate for growing vegetables, this is the best method because you know you will use what you grow. Native Method. If you already know what grows in your area, then focus on what grows well. Don’t grow artichokes if you have hot summers. Don’t grow carrots if you’ve got heavy, clay soil. Frugal Method. Grow vegetables that are expensive at the supermarket. Think of short shelf life, high consumption veggies like lettuce, or lower production volume but delicious cherry tomatoes that can cost $3 for just a half quart! Anti-Pesticide Method. You may want to grow certain vegetables that have the highest pesticide load, such as sweet bell peppers, celery, lettuce, spinach, potatoes, carrots and green beans. Tiny Garden Method. If you have limited space to grow, then you may find herbs and vegetables that don’t take up much space to be your favorites. You may also like the Square Foot Gardening techniques by Mel Bartholomew. Squirrel Garden Method. The opposite of the Tiny Garden Method and may require a large area. If like a squirrel with its acorns, you want to stow away vegetables for the winter, then think about setting aside garden space for storage vegetables like potatoes, onions and garlic. Think of what can be dried (beans, herbs) or canned/frozen (tomato sauce). We highly recommend Yin-Yang beans! Impress The Neighbors Method. Ok, so I am guilty of doing this with our purple artichokes that grow next to the sidewalk (purple anything is a great conversation piece). Go through your seed catalogs until you say “What the heck is that?” and then if it grows in your area, grow it in your garden. Grow it in your front yard to befuddle neighbors walking by with their dogs. love the great use of space in that picture. i think i’m going to start some seeds today myself. like this post, it’s a great way to help decide what you want to plant! Thanks! And it’s perfect for leafy veggies like lettuce that don’t require full sun, is often sprayed, & one of the more expensive (per lb) veggies in the produce section. #7 is my weakness. Not necessarily impressing the neighbors, but just something that looks neat. That would be why I bought 13 varieties of tomatoes last year. That would also be why I am no longer in charge of purchasing seeds. My aim is just to grow something!!! Maybe after I got that down, I may think about other strategies. 1, 2, 3, 4, and 6 are all factors though. Aaron, you’re right, success growing anything makes gardening a lot more rewarding! If you like salads, why not try buttercrunch? It’s one of the more expensive veggies but so delicious. Good luck with gardening in 2009 🙂 ! I love gardening, I am a vegetable gardener that will try growing anything, but here where I live now in okoki NZ I have a problem with earwigs eating my cabbages, anyone reading this may be able to help. Often earwigs are not a problem in the garden as they munch on organic waste (compost, dead leaves branches) and sometimes other insects. But when there are too many of them, they either run out of food and/or decide they like your plants better. That’s when they become real pests. Things to know about earwigs: they feed more at night. Love to hide under boards, debris, behind cabbage leaves – anywhere out-of-site during the day. I need to keep them in check esp. from young seedlings, and yes, I will hand pick and send them to the afterworld when I see them. Go out at twilight/night, hand pick them, and/or spray with insecticidal soap. We’ve also used “home-made beer traps“. These were originally meant for slugs, but apparently, our earwigs are bigger party animals than slugs! NZRob, as kids, we were once like your boys (reluctant in the garden). I remember despising tomatoes b/c of what they represented to me: weeding, weeding, weeding. Don’t despair as they’ll eventually come around, hopefully sooner than later. (Maybe if you stopped feeding them? 😉 ) Our son helps peel the garlic we grow in the garden and absolutely loves anything with garlic. Now his entire bed consists of garlic! on January 28, 2009 at 3:36 pm De in D.C. I go half Refrigerator and half Other, with Other being things that will grow decently in my shady yard and trying to optimize my growing season with crop rotation. You can also throw a tiny bit of Frugal in there, along with a dash of exotic (things I can’t find easily in a store or a farmer’s market). Ah yes, the Practical Method, too 😉 We have a bit more shade than we care for, but these are great for lettuces of all kinds (wife’s fav is buttercrunch) and other leafy veggies like chard, brocs. Which exotics do you plant? One of the 13 varieties last year was a yellow tomato! They ended up looking a lot like yellow bell peppers, and were delicious stuffed with chicken salad! Thank you very much for the reply, I learned a lot about earwigs from your reply, also about the slug home made beer traps, never heard of that before, but well worth a try, maybe cheaper than slug pellets, will try that on earwigs and let you know what happens. I use a combination of Native, Frugal, Tiny Garden & Squirrel methods of gardening, plus a few others. I grow several heirloom tomatoes that are “native” to my area (southern New Jersey, USA). I plant them in containers & keep them away from each other to try to prevent cross pollination. Of course I harvest the seeds to be used for the next year. If one could find these kinds of delicious tomatoes in the stores, they would be very expensive. My heirloom tomatoes are in great demand in the summer. I also plant several hybrid tomatoes plants in other areas of the garden. My entire garden is organic with soil that has been composted for years. No matter how much gardening space I have, it is never enough so the square foot gardening method is how I garden. Running next to my vegetable garden I have a butterfly and bee garden to encourage pollination. My garden is always alive with pollinators and lovely butterflies. I also use companion gardening. Certain plants like each other and certain plants don’t. For example, I plant tomatoes, peppers, parsley and basil together because they like each other. I also plant chamomile and summer savory with onions which improves their flavor. BUT onions and peas do NOT get along and will not grow well together. From late spring to late fall I am squirreling things away. I can and freeze vegetables; I not only dry and freeze my herbs, but also make oils, wreaths, crafts, gifts and other things from my herbs. WOW – that’s wonderful! Yes, having lived in NJ for 10 yrs., we grew “Joisey tomatoes” in our garden, though not with the sophistication you have built into yours 🙂 You also bring up very important points about companion gardening that we’ll blog about later in the year. Thank you for sharing your strategies with us! Dataetc – well thanks a lot! Now I’ve just got to try those yellow tomatoes! Yum! I just bought a bunch of seeds today, and I already have tomatoes, some herbs, and yellow bell peppers growing in pots. As usual, I probably won’t get it all planted, but oh well. I love your pic of the long, straight row by the fence. I’m doing a lot of that this year, interplanting with other stuff. Greenlasagna, you just put an idea in my head about yellow bell peppers. My wife loves them and I think we’ll be going for yellow tomatoes and bell peppers (in our cold frame) this year. Thanks and may the force be with your seedlings! I focus on 1 & 3..I really like the idea of the squirrel approach but it is so hard to know what will do well one year or the next since our weather is so variable (northern New York). You get an over-abundance of what you least expect sometimes! I don’t know why, but I hadn’t thought of the specifically anti-pesticide approach before. Funny, since I really don’t care for pesticides in my food 😉 All seems a world away with 3 feet of snow sitting on top of everything, but I think we’re really going to ramp up our efforts this year. Erika, if gardening were so predictable, we doubt there would be so many online gardening support groups! I remember the year we had broccoli growing out of our ears and then another year when they barely produced enough for a meal. So you just do the best you can. That’s the fun (and sometimes frustrating) part of gardening 🙂 Yes, the pesticide strategy is def. something to consider! Thank you for all of the gardening tips. We lived in Palo Alto for several years and loved Half Moon Bay! We took our daughters to pick out pumpkins there…great memories! The beach was wonderful, too! Thank you for all of your help about gardens. Do you have some advice about building a cold frame? We live in southeastern Colorado, elevation around 4,000 ft…high desert plains, about 1 1/2 hours from Kansas! We’ve got to start our veggies inside next year. Our last frost is typically around the middle of May. Thank you so much for your help! Hi, brand new here, first “real” garden in over ten years — and my first garden didn’t even produce radishes, so I’m starting from the be-gin-ning! Your post was a great help in two ways: keeping me enthused, and reminding me that I do *not* have the entire back yard converted into gardening space, so I *must* pick and choose what to plant. Glad the post was useful to keep up your gardening spirits 🙂 How was the white eggplant? We haven’t tried that yet!